This is a retrospective review of the senior surgeons series ( Model I and II) of using the same-cemented stem and modular neck design (R-120™) with the exception that the second series had an improved modular neck construct. Model I, 145 stems implanted between 2002 and 2005. Taper neck problems consisted of two neck trunnion fractures at the neck-stem junction and one modular neck disassociation at the modular junction. The stem was voluntary withdrawn from the market and redesigned to a more robust structure. Model II, 188 cemented-stems were implanted between 2007 and 2011 by the senior author utilizing the same surgical technique. There have been no modular neck taper problems in this series. This paper will demonstrate that once a modular junction problem has been identified corrective action can be taken to resolve the problem. We believe that there is a benefit to a modular neck-stem junction cemented stem design, and that all modular junctions are not equal in design or function. 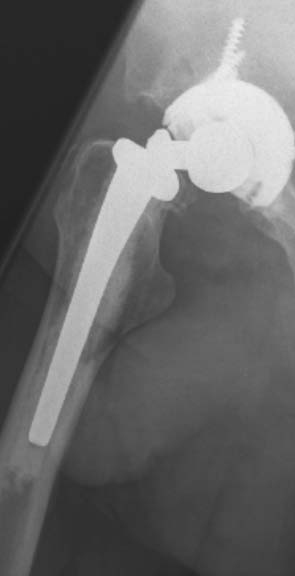 Cemented stems are still widely used in total hip arthroplasty (THA) especially in Europe, [1,2] however there are still concerns with adverse effects of bone cement in that biomaterial properties of the cement contribute to the pathologic state that separates this disease from other modes of mechanical loosening. This leads inevitably to the conclusion that Cement Disease does exist . The senior author still uses cement in 15 to 20 percent of cases in Dorr type C bone. Reconstruction of the joint mechanics (combined anteversion) to prevent impingement of the stem on the cup and avoidance of bone-on-bone requires correct restoration of hip neck length and femoral offset regardless of cement or cementless fixation [7,11]. The senior author’s cement technique uses a broad stem design with a smaller cement mantel as compared to other European style stems (Execter) so intraoperative version adjustment is limited. Traditional cemented and cementless stems since the 1980s have had one common denominator that being a modular head neck taper junction. The success of a self-locking taper is influenced by the design of the taper, particularly the taper angle, the roughness, and the mating materials between the “male” and “female” components. The major advantage of modularity at this junction was to provide some level of adjustment of leg length or vertical height to reduce leg length discrepancy. Version and femoral offset were still difficult to adjust or fine-tune and as a result of growing acceptance of modularity the neck-stem junction seemed to be the next logical area of product development. . 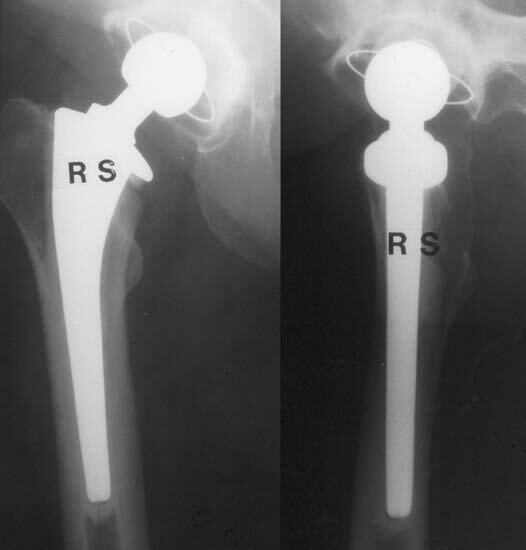 Original cemented stem R-120™ by Osteoimplant Technology Inc. (OTI) Hunt Valley, Maryland, USA. Stem and modular necks are manufactured from CoCr alloy. The shape of the stem is trapezoidal with a large collar that provides for impaction and compression of the cement. The stem collar is made with a cavity where a self-locking taper and a positive indexing mechanism provide 12 different positions to ensure proper restoration of joint mechanics (Figure 2). Figure 2. Patented 12 indexable modular neck-stem junction allows for fine-tuning joint mechanics. 145 stems were implanted between 2002 and 2005 in 50 males and 95 females. Mean age 72 with 2 patients under the age of 60. 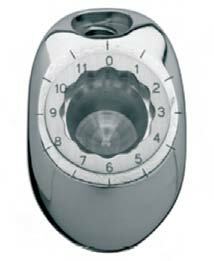 CoCr heads 28 or 32 mm were used and all cups were cemented polyethylene sockets. Surgical incision for both cohort of patients (Model I & Model II) was a Modified Anterolateral Watson-Jones Approach. Maintained the same stem shape and dimensions with the exception of the modular neck stem junction. The failure mode of the model I design was basic fatigue failure caused by an under-designed modular junction. 188 stems implanted between 2007 and 2011 in 79 males and 109 females. Mean age 75 with 14 being younger than 65 years of age. All stem were cemented and all cups were non-cemented with porous press fit hemispherical components. 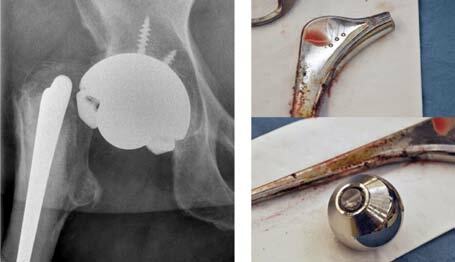 • All femoral heads for both series were 28 mm or 32 mm diameter. 32 mm diameter is preferred head size with improved highly cross-linked polyethylene. All devices are subject to fatigue failure especially with the increased patient activity we are seeing today. There are reports of device failure regardless of material, and regardless of design style (monoblock, modular) (Figures 4, 5) . In our cohort of 145 patients with Model I of the R-120 modular neck cemented stem all femoral components, modular head, modular neck and stem were Co-Cr material. Five patients presented with sudden symptoms of generalized hip, groin and buttock pain and inability to ambulate. Evaluation demonstrated 3 patients with modular neck stem junction failures. 2 modular neck fatigue fractures as depicted in figure 5 and figure 7. One fractured neck was revised to a long cementless S-Rom® stem (Figures 7a, 7b). Second fractured neck was revised with tap-out, tap-in technique as the Model II stem was identical in size and shape but had the improved modular neck-stem junction (Figures 8a, 8b). Both modular neck fatigue failures had 35mm neck lengths with a long modular Co-Cr femoral head. 1 modular neck disassociation was revised to a cementless S-Rom stem. Three modular neck-stem failures resulting in explantation represents a 2% revision rate. A total of 7 revisions out of our cohort of 145 represents an overall revision rate of 4%. 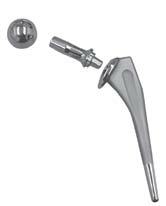 In our cohort of 188 implanted stems with the Model II R-120 modular neck cemented stem there were no issues with the modular junction. The initial series of Model I had a modular neck complication in three cases out of 145 implanted stems, for a 2% complication rate of the modular neck-stem junction. The manufacture (OTI / Encore) based on additional reports voluntarily withdrew Model I from the market (2006). After additional testing and development an improved modular junction (Model II) was reintroduced (2007) with the same overall design features of the original R-120 cemented stem. In our Model II series there has been no complications with the modular neck-stem junction out of 188 stems implanted. Combined results on 333 stems implanted for modular neck-stem junction problems were three or a 1 % complication rate. Further in this combined series of using this novel modular junction design fabricated with the same material as the stem (CoCr) there have been no cases of delayed hypersensitivity and no cases of pseudo tumors. So is there a definitive set of numbers for CV to reduce mechanical impingement and dislocation? Obtaining optimal implant positioning is critical for reducing these complications. Our experience with modular necks demonstrate that the best mechanism available is trial range of motion with trial implants. Modularity at the neck-stem junction provides for fine-tuning implant orientation prior to final implantation of definitive components. Often the final orientation of the femoral neck as determined by trial range of motion indicates a head-neck position of retroversion. In our combined series of 333 stems implanted we had one postoperative dislocation for a dislocation rate of 0.3%. Two fatigue failures and one modular junction disassociation in Model I cohort of 145 stems implanted represent a failure rate of the modular junction of 2%. Combined series total of 333 stems implanted had a 0.9% complication rate of the modular neck-stem junction. Manufacturers have all but discontinued modular neck-stem designs because of first generation failures. This, in our opinion, is a mistake. Fatigue failures of this first generation design have been identified and the redesigned modular junction (Model II) with 188 stems implanted between 2007 and 2011 have not demonstrated any modular junction complications. To give up on design concepts that have viable contributions to improve clinical outcomes is a failure in itself. Our early pioneer surgeons (Sir John Charnley, Maurice Muller, Charles O. Bechtol, Charles Townley and others) did not surrender to early failures. 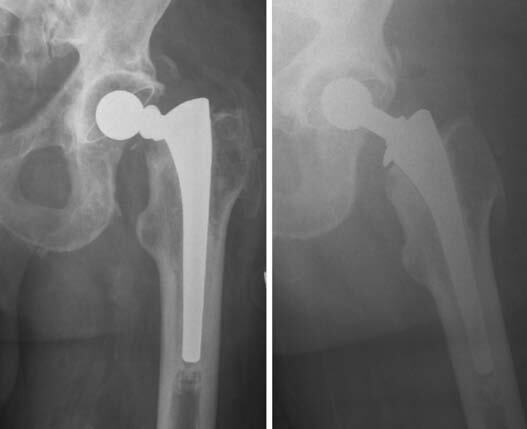 They reviewed, learned and improved clinical surgical results for Total Hip Arthroplasty. Product and surgical techniques need to be tightly controlled during the early stage of development and fully evaluated before general market release. This improved model II R-120 cemented modular neck-stem junction has proven to be safe and efficient in our series and we encourage the manufacture not to give up on it (Figure 10). Modular neck-stem junctions have been under criticism as a result of fatigue failure and trunnion corrosion. Our experience with this novel modular junction has the benefit of being fabricated using the same material (Co-Cr) for the stem, neck and femoral head. Failures in the first generation demonstrated that the modular junction was under designed with regard to overall fatigue strength. This has been correct by increasing male taper diameter by 13.5%, taper length increase by 14% resulting in a 40.7% increase in surface area. Further in this combined series of using this novel modular junction design fabricated with the same material as the stem (Co Cr) there have been no cases of delayed hypersensitivity and no cases of pseudo tumors. The senior surgeon still uses this modular neck-stem cemented stem and will continue to follow these cases. Guerin S, and Jones C. Cemented Femur. In: Cashman J, Goyal N, Parvizi J, eds. The Hip: Preservation, Replacement and Revision. Baltimore, MD: Data Trace Publishing Company; 2015: 71-1 to 71-10.